- ECW Heat Wave '99 (August 2) = Jazz defeated Jason. - ECW Arena (August 28, 99) = Jazz, Super Nova & Chris Chetti fell to Danny Doring, Amish Roadkill & Angelica. - ECW Anarchy Rulz '99 (September 19) = Jazz won, via DQ, over Tom Marquez. - ECW Arena (November 27, '99) = Jazz was pinned by Simon Diamond. - ECW Guilty As Charged '00 (January 9) = Jazz, Kid Cash & Nova fought against Roadkill, Simon Diamond & Danny Doring. The match, however, finished out with Roadkill & Danny Doring winning over Chris Chetti & Nova. - ECW Cyberslam '00 (April 22) = Jazz & Nova were beaten by Lance Storm & Dawn Marie. - WWF Survivor Series '01 = Jazz lost a "Sixpack" Match to Trish Stratus, who won the vacated Women's Title. The other participants were Jacqueline, Mighty Molly, Ivory and Lita. - WWF Royal Rumble '02 = Jazz lost to the Women's Champion, Trish Stratus. Jacqueline was the special referee. - WWF Wrestlemania X-8 ('02) = Jazz retained the Women's Title, winning a "Three-Way" match over Trish Stratus and Lita. - WWF Backlash '02 = Jazz defeated Trish Stratus to stay the Women's Champion. - WWF Insurrextion '02 (May 4) = Jazz & Molly Holly fell to Trish Stratus & Jacqueline. - WWE Wrestlemania X-9 (March 30, '03) = Jazz lost a "Triple Threat" Match to Trish Stratus, who won the Women's Title. Victoria was the other participant. - WWE Backlash '03 = Jazz won the Women's Title from Trish Stratus. 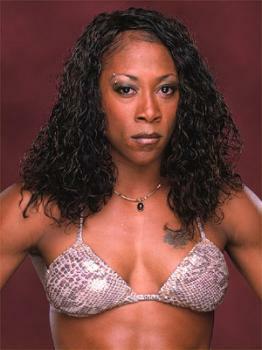 - WWE Judgment Day '03 = Jazz stayed the Women's Champ, beating Trish Stratus, Jacqueline & Victoria. - WWE Insurrextion '03 (June 7) = Jazz defeated Trish Stratus to keep the Women's Title. - WWE Summerslam '04 (August 15) = Jazz, Trish Stratus, Molly Holly, Gail Kim, Victoria, & Nidia lost a "Dodgeball Elimination" Match to the Team Raw Diva Candidates. - WWE Taboo Tuesday (October 19, '04) = Jazz competed in a "School Girl Battle Royal", which was won by Women's Champion Trish Stratus. - WWE vs. ECW (June 7, '06) = Jazz lost a "Non-Title" Match to the WWE Women's Champion, Mickie James. - AJW Chickfight Tournament 5 (June 24, '06) = Jazz beat Simply Luscious and MsChif before losing in the finals to Cheerleader Melissa.